Wouldn’t you love to receive a basket like this? I have enjoyed a few Gourmet Gift Baskets over the past year and I want to share with you that they aren’t just professionally put together and look fantastic, but they are filled with a great variety of treats too! Food and snacks that really are Yummy! This is the Sweets Gift Basket (perfect for Sweets Week!) and my family dug into it the other night for dessert to taste test everything inside. It was a lot of fun seeing what everyone’s favorites were. Mine was the Milk Chocolate Orange Sticks by Sweet Candy Company as any fruit covered in chocolate is my fav! Hubby surprised me and has taken the box of White Chocolate Key Lime Cookies by J&M Foods and hidden them so the rest of us won’t eat them all. ha! If you like dipped Oreos then you’ll love the Dark Chocolate Dipped Cookies by Supreme Chocolatier. They went fast! The Chocolate Dipped Mint Moravian Cookies by Salem Baking are perfect to grab a little chocolate fix. This is just the chocolate! Those are the pieces I wanted to highlight for you choco-lovers, but the goodies didn’t stop there! Cinnamon Honey Dipping Pretzels and Cinnamon Bun Caramel Sauce by Robert Rothschild was a fun treat to try. We can’t wait to pour the sauce on a little ice cream. Yum! Munch on Almond Pecan-dy Crunch by Morley Candy Makers -or Buttered Peanut Crunch by Old Dominion Peanut Company anytime of day for a sweet fix. And if you are like us you like to end a meal with a mint. Holland Mints by Marich Confections were terrific! Hit the spot. 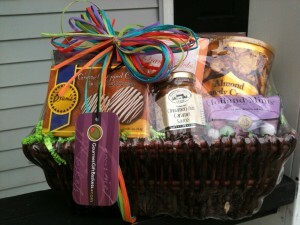 Gourmet Gift Baskets has HUNDREDS of baskets for any occasion. LOTS of Valentine’s Day Gift Baskets! Show your love! Or grab one to share with the whole family like we did. It made our meal lots of fun! The baskets Ship for FREE! I was sent this basket for review. Was not compensated in any way and all opinions are my own. This giveaway will end on Feb. 9, 2012 at midnight EST. Winners will be drawn via rafflecopter. Once a winner is drawn I will contact them and they will have 48 hours to reply before I draw a new winner. Giveaway is open to anyone in the US/Canada and you must be 18 years of age or older. Giveaway not affiliated with Facebook. Winner will be posted in the rafflecopter widget. I just visited their site and the Brownies Sampler Bakery Gift looks especially delicious right now. I love the wild about you basket! My husband would love the Beer B-Q Bucket! I did visit. I think the snack gift baskets look great. Yes, I have. Their chocolate gift baskets look great! yes, I visited their site! What a wonderful variety of baskets they have!! Thanks for the giveaway! Gourmet gift baskets has such a huge and wonderful selection. Sure to find something to please anyone. Thanks so much. Yes I have; they have so much to offer! I would love to win one! Such a large variety and collection! I love finding new sites to buy from on blogs and reviews! No, I've never visited their website before, but I just did and they have SO much to choose from! Great variety! Yes, I have and they have very nice gift baskets for all occasions! I have visited Gourmet Gift Baskets, they have a fabulous selection! Oh my... i have visited their site MANY times & drool..... I want to try so many of them! Perhaps I should throw this out as a xmas or bday gift idea for my in-laws who have no idea what to get me. Thanks! I have visited their site, and I want to order one of their breakfast baskets. Yes I have! They have so many to choose from! They even have a Microbrew Beer Bucket Gift Basket. This could get ugly, for my wallet. I love love love Gourmet Baskets. I miss sending them to my Daddy. What a`great variety! They'd make great gifts! Like their breakfast baskets also! I've never heard of them until this review and giveaway, but the gourmet cheesecake sampler basket looks delicious!!! Yes! I have visited their site a few times and am amazed and almost overwhelmed with how many fabulous baskets they have to choose from! I did just now, my fave basket is the Wine Lover's Suitcase Trio! this is my first visit to their site - and it's bookmarked for good now! So yummy! I have visited them, and have my eye on something for my husband this year for Christmas. I think he would really love any of those awesome beer buckets! I just did! I like the Around the World Beer Bucket. So cool!!! They have beautiful gourmet gift baskets artfully arranged with exquisite full-sized treats and gifts! They all look yummy. Yes, I have bought Gourmet Gift Baskets as gifts several times. they have gorgeous baskets! i would love to have any of them! I've been to their site several times before. They have the most amazing gift baskets! My mom just asked me to send a basket to a friend of hers, so I am looking forward to seeing what she gets. Im going to snoop at her basket when it arrives! I love dark chocolate !! Want to try the Oreos!! As much as I like chocolate, I'm happy to see they offer some other candies in their baskets as well. have visited their site before, but never bought. Many baskets look yummy! I may have to try them soon. The baked goods looks soo good!! I have visited! I love their gourmet and breakfast baskets. I would love me some red wine and dark chocolate gift basket! I like the ones with chocolate! I have visited before and would love to win this gift basket. My husband would like the Sweets for My Sweetheart basket. I'll be jiggered. They have beer gift baskets. That's a new one to me! I have visited them before and would love to get their Brownies Sampler Bakery Gift. I have not visited before, but it looks delicious! i love their baby baskets too! Wow. They have some really nice baskets. Yes, I've visted their site and I love their stuff. I love the Extreme Tailgating Basket! I like all their baskets but the chocolate is my favorite. I have visited the site. Many great baskets to choose from. Just did, and I could do some serious damage on that website!! I had not visited their website before but I was amazed at the wide variety of items they have. Surely there is something for anyone you can think of since they have everything from fruit to baked goods to beer! I've visited Gourmet Gift Baskets before. I love the variety of baskets offered, and you can find one for any occasion. Thanks. I have so many things on their site that I would love to have given to me! LOL My two favorites are the Organic Gift Basket - Premium Product ID: 4042 and the Ultimate Pampered Cat Gift Basket™ Product ID: 6501! Would love to have either of these!!! Yes, I have visited the site ... and there is nothing I don't like! I have used gourmet gift baskets for Christmas gifts to out of state family! yes, i love their stuff! I love you basket sweets for my sweet heart my Donald would have loved it, it is full of all that he loved, but he went to be with the Lord , thanks for a great give away, hope I win, GOD BLESS AND KEEP YA'LL SAFE IN GODS HAND. I have visited their web site before, I love the ravenswood white wine gift basket! Whoopie Pie Sampler Bakery Gift --one to give and one to keep! Yes, I checked out their site. Gift baskets are great for people you don't know what to get for. visited their website and their baskets for kids are adorable! yes I have visited their site they have awesome gift baskets! This was my first time and wow, what a site! Eveything looks so delicious! and also seems reasonably priced! Yes I love their gift baskets. I have browsed and drooled! I would like their Around the World Beer Bucket. Mix cheddar with leftover heated beer and I get Welsh Rarebit. Yummy! I have visited the website, and I would take pretty much any of their basket combinations. love them and so many to choose from. The Organic Gift Basket - Premium looks great! I drool over their baskets on a regular basis! Not just the baskets, the cheesecakes too! Mmmm. I have visited too many times ..lol I love their baskets yummy!!!! I have gone to their site before and I would love just about all of them! Fabulous gifts - hard to choose! I'm a chocoholic fan. I love the wide variety of baskets they offer,especially the bath & snack basket. I haven't but I will now! I love gift baskets! Especially ones with food in them! Just visited their site and Coffee and Chocolates Gift Basket Classic™ looks good to me! I've never been before, but they definitely have some interesting baskets! I would love to try their bountiful harvest fruit gift basket too! I have visited them in the past and just did again. I love their coffee and chocolates gift basket selection! I've never been to their site, but about to take a look. The company I work for also offers some really nice gourmet baskets :) shhhhhhh don't tell i'm entering this contest! I have visited their site and love the variety of gift baskets they offer. I'm particularly partial to all the chocolate themed baskets!! I love Gourmet Gift Baskets~They have such a great selection! I have been to their site & it makes me drool! I have visited. They have some great gift baskets and a huge variety! I LOVE the Around the World Beer Bucket on Gourmet Gift Baskets. Wonderful! I just did and those baskets are to die for!!!! Visited the website and everything looks so special, delicious and tempting. It would be a really awesome treat to win ANYTHING from that site! I haven't looked yet, but I will. I love gift baskets! WOW!!!!!! THOSE ARE SOME AWESOME BASKETS!!!!! I WOULD TAKE ANY ONE IN A HEARTBEAT. THOSE ARE W A Y MORE WHAT GIFT BASKETS SHOULD LOOK LIKE, DEFINATELY WOULD BRING A SMILE TO SOMEONE'S RAINY DAY!!!!!! LOVE LOVE LOVE!!!! THANK U FOR THIS GIVEAWAY!!! I WOULD LOOOOOOOOOOOOOOOOVE TO HAVE ANY OF THESE BASKETS!!!! i've purchased something from their site before, i absolutely LOVE their stuff! What a great selection of gift baskets! I would love the Coffee & Chocolates basket!! yes i have! in fact, i ordered some valentines gifts from there! I love all the breakfast and baked goods baskets..actually they all look great :) Thanks so much for this great giveaway!! Yes I have, can't do it too often though - the drool messes up my laptop! I have not visited until today. Luv to have the Jumbo Snack Gift Basket! Yes, I've been to Gourmet Gift Baskets website. Makes me want one so bad! Nice! I like the Gourmet Cheesecake Sampler... Love cheesecake! I love all of their gift baskets. I just visited, and think I might end up ordering something myself! Ooh Those Breakfast Baskets look awesome! I love their Sweets For My Sweetheart™ – Valentine’s Day Gift Basket! I have visited and think its great! I have visited them plenty times and love their baskets! Yes! They have such amazing baskets, and such variety to! I would love to win! Yes I have visited and love the chocolate and wine gift baskets. I have visited their sit before everything looks awesome!! I have checked it out several times. The Sweets for My Sweetheart Valentine's basket is AWESOME! I havent ever been to their site but I did after this review and they have some great stuff! yes, they have a Around the World BEer gift basket that I think is really cool. I tried the Christmas Gourmet Gift Basket, and it was a HUGE hit!! Been to the website and drooled over all the goodies! I want the Beer Basket, like now. I have visited Gourmet Gift Baskets several times and they have an excellent variety of items! Yes I have visited a number of times. so many baskets to choose from! Love their huge selection! The Bountiful Harvest Fruit Gift Basket looks good! Their Wild About You™ – Valentine’s Day Gift Stack is awesome! 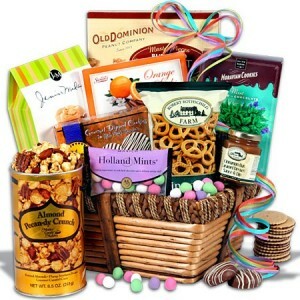 I really love the Chocolate gift basket...this is a great website and I would love so many of the baskets. Love the Champagne & Truffles Gift Basket! I'd like thefisherman's feast seafood gift basket. Thanks for the giveaway. They have the best Valentine's Day gift basket I have ever seen. I love how you can find something for every occasion. Yes. I would love to get my hubby the Valentine's Day Breakfast In Bed Gift Basket. I received a gift basket from them last year and my family loved it. I just checked it out, they looks so yummy! I'm on my way to check out their site now. That photo alone in your post sold me! I like the Classic Spa Gift Basket. I have visited the site and they have some great items for sure. Yes, they have a great selection Thanks for the contest. It's not good to browse that site when i'm hungry... lol. That Something Naughty and Something Nice gift set looks delicious! yum this was my first visit to the site. Who doesn't love a Gift Basket?! They are the gifts that keep on giving. Lots of surprises in there. I have several picked out for possible gifts. Coffee and chocolate...doesn't get any better than this. Yes, I often browse the Gourmet Gift Basket selection. I like their fruit baskets. I like the Ultimate Chocolate Gift Basket too! I've never visited there website before. Need to take a look around. I want them all lol They look so good. Yes, I have visited their site before and love all the gifts baskets that you can choose from. I really love the beer gift baskets for my husband for Father's Day as a great gift from all of us. looks like an awesome website, ill need to check it out some more! I hadn't until tonight - SO many cute baskets - I will have to get some for the extended family to celebrate Valentines Day! I just visited Gourmet Gift Baskets and would love their Toadally Yours™ – Valentine’s Day Gift Basket.They have awonderful collection. Wow,they all look so Yummy!